For All Those on Crete "Seaking Adventures"
Since moving here to Crete I’ve had the distinct feeling that Poseidon has been watching over our little family. This weekend the god of the oceans gently guided us to join the crew of a fantastic boat tour company, appropriately named, Seaking Adventures. Here’s our ship’s log of our journey to fantastic Thodorou Island, off Platanias. Paul-Jules’ tenth birthday, September 22, 2018, and all he wanted was to hold an octopus. Having seen the video I’d shown him of Seaking Adventures’s Master Diver, Ioannis Petrakis (feature image) educating kids about indigenous sea creatures, all our boy wanted was some Jacques-Yves Cousteau action. So it was, we set out from our old-fashioned (and marvelous) sea-front Vasiliki Apartments (a plug because we love you) toward Porto Platanias where Seaking Adventures moors their boats. We found the place pretty easy to find on account of the superstar smile the company’s sales manager, Sophia wears so proudly. As the first face tourists see when arriving at this quaint little marina, Sophia (via Instagram below) is the perfect ambassador of good sailing. I cannot say enough about her good disposition and the wealth of information about Crete she has. The same holds true for all the crew of this tour company, I’m happy to say. With Paul pacing the wharf like a nervous pirate we were thrilled to see our boat arrive carrying other travelers, and pretty soon we answered the call to board for the trip across the bay. Ioannis was there with a strong hand to help everybody aboard, and pretty soon a half loaded twin engine launch was underway. Theodorou Island (Agioi Theodori) is the larger (282 ha.) 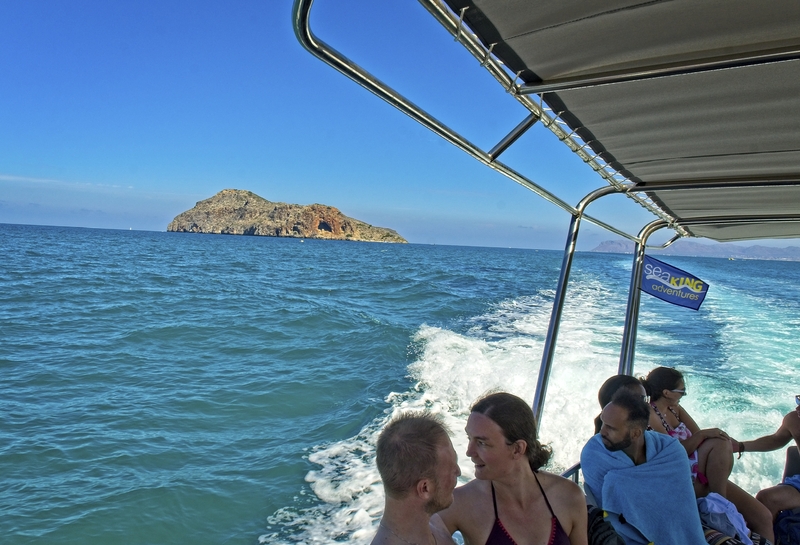 of two small islets (the smaller is Lazaretta) that lie 1.6 kilometers offshore of the Platanias Marina. 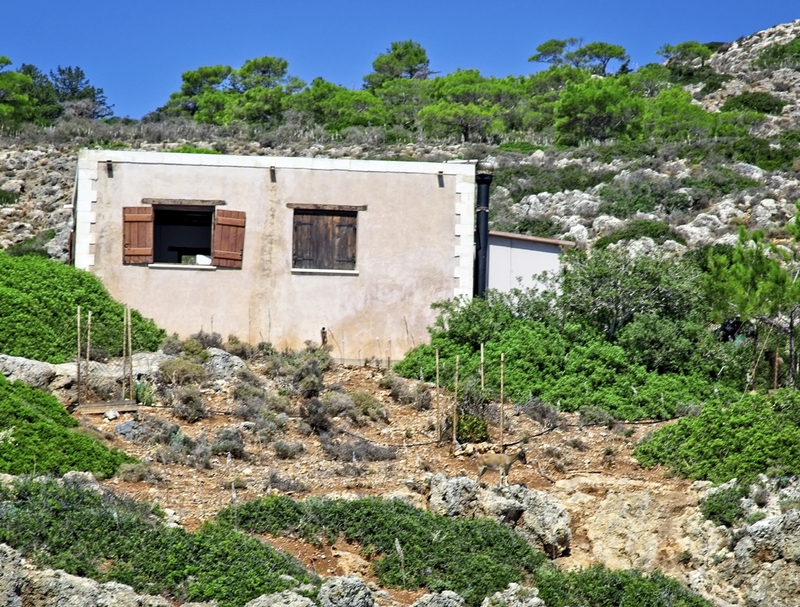 Also known in antiquity as either Akytos (meaning unsuitable for habitation) or Letoa, the island has a fascinating history. A sacred sanctuary in the Bronze Age during Minoan Times, the Venetians built an amazing fortress known as Turluru atop the highest cliff of the island to defend the coast of Platanias and greater Crete against the invading Turks. Today the Thodorou Islands are the protected home of the Cretan Ibex, or the famous Kri-Kri, the wild goat of Crete that roam free here. You can just make out one of the well-camouflaged animals standing on a rock just beneath the caretaker’s house in the image I took below. Both these islands are uninhabited now and it is actually illegal to make landfall on them. Besides being the sanctuary of the protected Kri Kri, the islands are home to falcons and many types of migratory birds. Our superstar guide Ioannis gave us a running history and geology lesson on the approaches around the windward side of the island. We were all a bit amazed at how much information the dive master had to offer, not only about Thodorou Island, but about the geophysical characteristics of the Mediterranean, Crete, and in particular the tectonic activity that forces Greece’s biggest island skyward at a rate of 1 cm. per year. After a thorough indoctrination into the history (ancient and modern), we filled-in on the close-in wreck of a Nazi Ju52 downed by anti-aircraft fire during the Battle of Crete in May of 1941. Later on, we were given the opportunity to free dive the wreck and the only anchorage on the island. 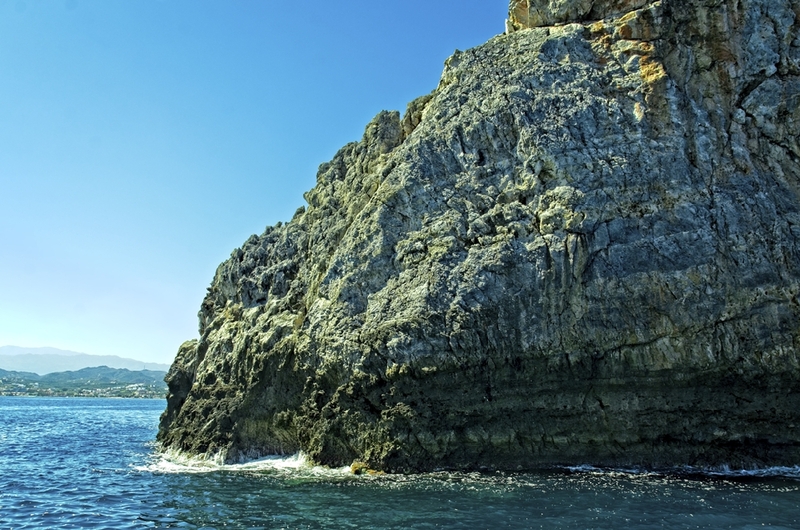 When our skipper, Antonis Kalitzakis (Αντωνης Καλλιτσακης), hove to in order that we passengers could take in the approaches to the island, we could not help but be amazed by the special geology of Thodorou. The rocky cliffs shoot straight up from the sea toward a gaping cave and what remains of the previously mentioned Venetian fortress, like something out of a Hollywood classic film. At a point, Ioannis noticed I was carrying a camera, and asked if we’d like to sit in the bow to take pictures. The one below gives you some idea of the natural seascape we experienced. Once on the leeward side of the island, Antonis hove to again in order to let Ioannis over the side with fishing net and weight belt, a move which puzzled my wife Mihaela and our son Paul greatly. 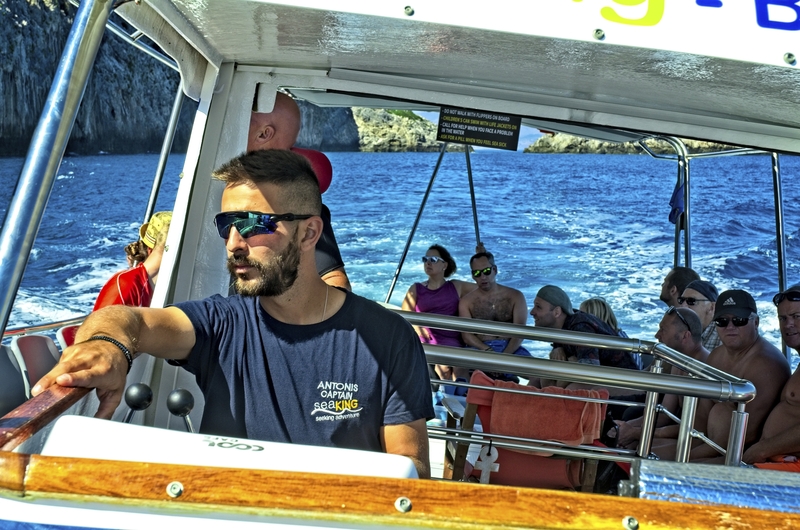 As it turned out, each trip Ioannis is let off some hundreds of meters from the small cover passengers dive at, in order to scour the sea bottom for sea friends and sea monsters. All passengers were dully impressed (and worried) once the skipper throttled up to leave the diver in our wake. But Antonis assured us all that Ioannis knew the way back to Platanias marina. Later on we were all convinced the two kilometer swim might have proven ordinary for the fit Ioannis. Swim Call! Looking down at the bottom in the cove we anchored at, I could not help but recall my childhood dreams of skin diving for treasure, and kid games that later led to real-life seafaring. The sea has this special character, for those who understand, a way of calling to something in the spirit. And I know our little family felt this coming from the Ioannis and Antonis. There’s so much gentle confidence in people who live from the sea. I guess that’s the best way of putting it. Needless to say, Paul Jules was thrilled to be swimming in the “big water” with no pool steps or ladders for assurance. Having only learned to swim only this Summer, our athletic little boy seemed to find his sea legs quickly – and I guess it was my mission to ensure the Cretan life is infused in him. This paradise is, after all, an island full of island dwellers. Our little snorkeling adventure had only just ended when Ioannis emerged at the stern with a net full of sea life. Thrilled, Paul yelled; “Has he caught an octopus?” This was, of course, followed by “Can I hold him?” once the diver passed the net onboard. Once Ioannis climbed aboard we were all treated once again to a magical education session starring; five octopi, two sea cucumbers, two sea urchins, and a very interesting Triton snail, otherwise known as a Triton’s Trumpet. Keen to satisfy Paul’s now constant pleas to be friends with the octopus, Ioannis produced one after another of them while explaining their uniqueness to us onlookers. Meanwhile, he put one in a bucket so that our son could get better acquainted by himself. Again, we were amazed by the man’s broad knowledge. A second swim down to the 76 year-old German Junckers wreck seemed an almost anti-climax even for a history buff like me, but the wreck is fascinating on its own accord. But with time growing short, our skipper bid us aboard for the trip back to the marina. My wife Mihaela now felt the pleasant drain that the calming sea has on many people. I watched on the way back as she stared off a bit starry-eyed at Chania and Platanias in the distance. 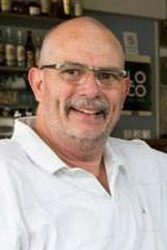 Paul? Well, he could not stop bugging Ioannas with questions. We bid our cool skipper Antonis farewell and on hitting the gangplank the diver stopped me to whisper something about little Paul coming back to learn more about his pals the Octopi. I cannot say exactly what he said, as it was in confidence sort of. But I will tell you the diver and his mates made an indelible impression on us all – and particularly on a young adventurer – which is kind of the point anyhow, isn’t it?